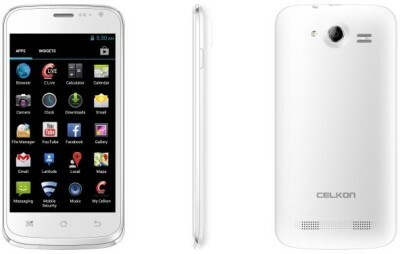 Celkon Mobiles has launched the AR45 RahmanIshq music smartphone at an event in Kolkata, India. The handset was launched by the A.R Rahman himself. The Celkon AR45 is the first smartphone in Rahmanishq series. The mobile phone comes with bundled features that makes it apart from other budget dual-core smartphones. The device comes with Dual Speakers and K-class amplifier to provide users music enrich experience. The RahmanIshq AR45 also has Shake and transfer feature (by which users can transfer data by shaking the phone), new customized music player and new USER INTERFACE. The Celkon RahmanIshq AR45 comes with 4.5 inch capacitive touch screen display, probably have FWVGA resolution (854×480 pixels). The handset draws the power from 1.2 Ghz Dua-core Cortex A7 Processor paired with 512MB of RAM. It runs on Android 4.2.2 operating system. The handset Rahmanishq AR-45 has Dual SIM access, 3G, WiFi 802.11 b/g/n, GPS, Bluetooth 4.0, micro USB port, FM radio and 3.5mm audio Jack. The device packs with 5-megapixel Auto focus primary camera and a 0.3MP front facing camera. It has 4GB of ROM (internal memory), 32GB Expandable storage via microSD card and 2000 mAh battery. Considering the specs and features of the phone it would compete with Micromax A88 Canvas Music, Gionee Pioneer P2 and Spice Mi 436. Although there are many other handset that can compete with the handset but the above 4 are the main Rivals. Android 4.2.2 jelly bean OS. 512MB of ROM, 4GB ROM, 32GB via memory card slot. 5MP AF rear camera and a VGA front facing camera. Proximity sensor, Accelerometer and G sensor. The Price of Celkon AR45 is RS.7,999 and the it would be available in India from October.